The Table is a flat, sunken piece of land about the size of a football pitch, hidden in the Quiraing. By walking along the escarpment above we get this view down (with Staffin Bay in the distance). This hidden gem can be difficult to photograph, being quite gloomy against a bright patch of sky, but on this occasion I was able to strike a good balance while capturing the lovely cascade at the foot of the falls. A particularly high tide washed over the rocks along the shoreline of Waterloo on the southern edge of Broadford Bay. 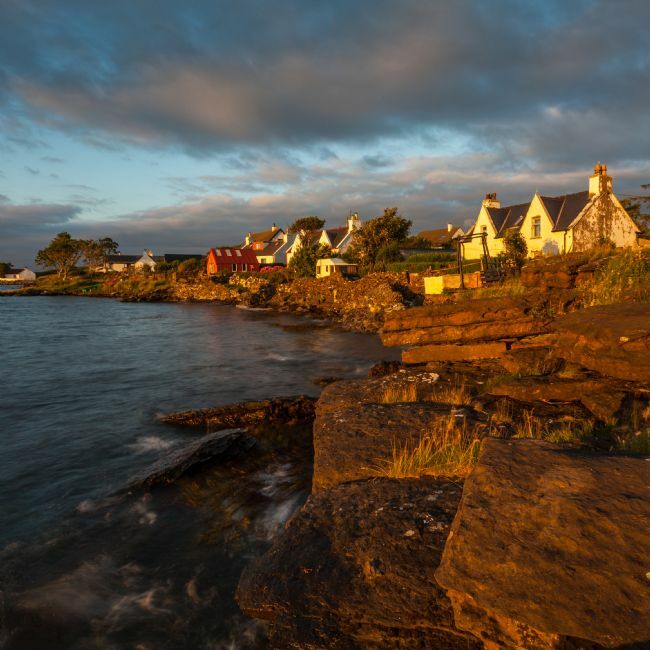 The late evening light warmly lit up the shoreline properties. It was by no means the photograph I'd gone out looking for but it was pleasing nonetheless. Normally I avoid photographing in mid summer, or mid day, but here I broke both of these norms. 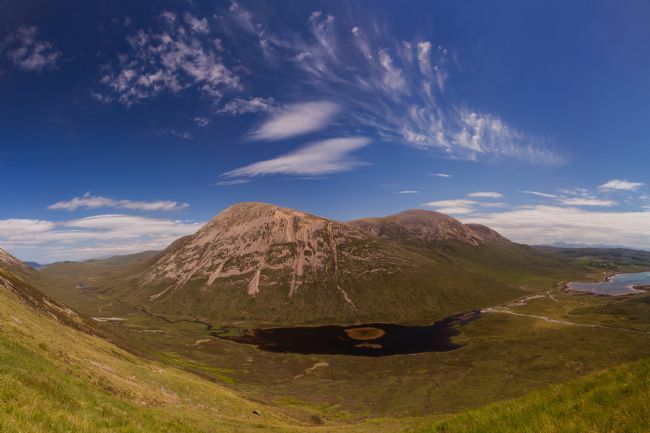 Having climbed part way up one of the slopes at the end of Loch Slapin, the view across the glen between Torrin and Luib lay in front of me, and with an interesting sky to top it all. 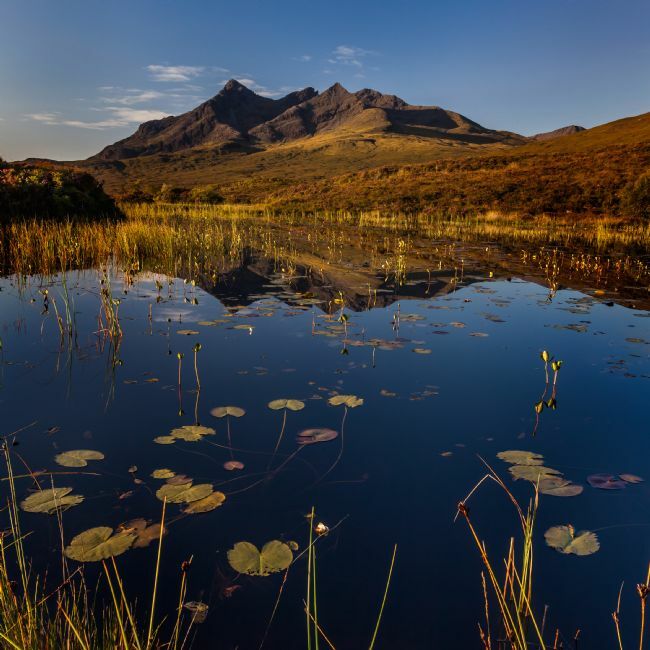 This panorama across the Red Cuillin has been created from several images, so it distorts the true lie of the land a bit. One edge to the other covers a field of view of almost 180 degrees. The central dark loch has a light patch of reeds or some kind of pond weed in it, I'm not really sure what as it was all largely just below the water's surface. 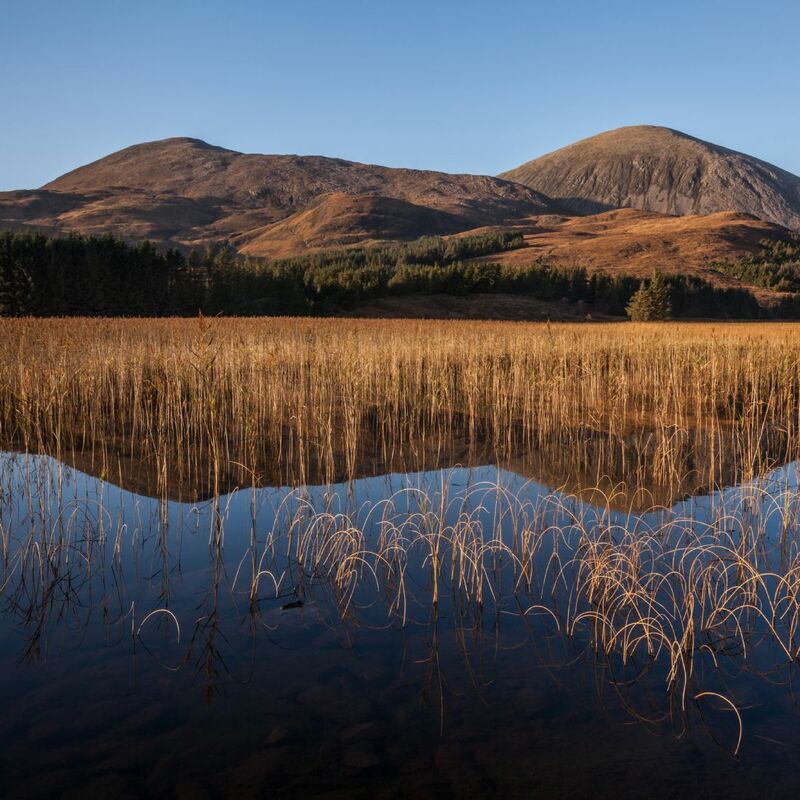 I would guess that the unusual dark colour of the loch comes from the peaty soil. 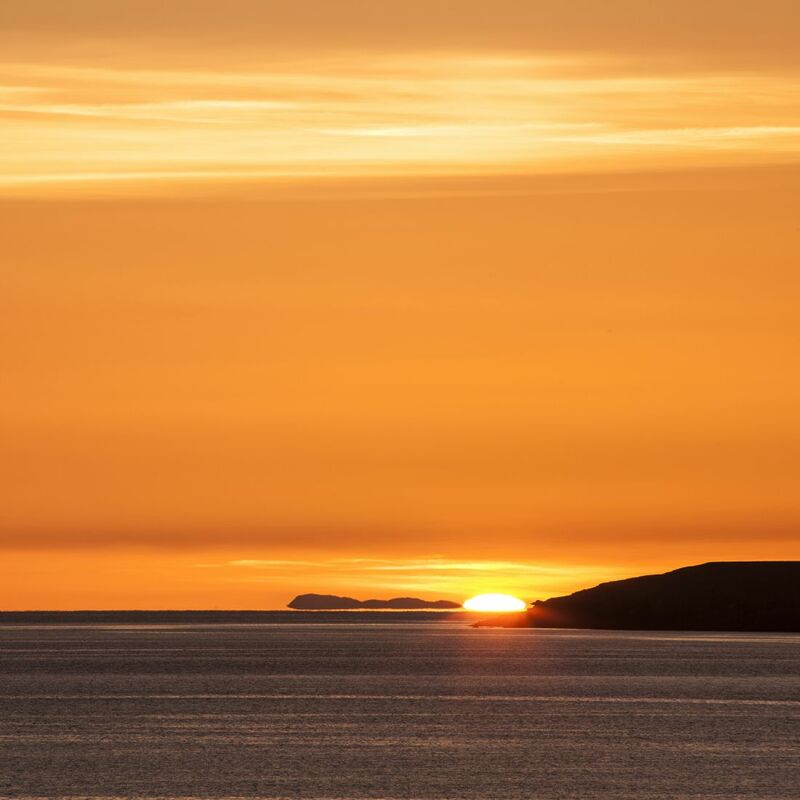 Another of the huge variety of sunsets that Elgol produces. 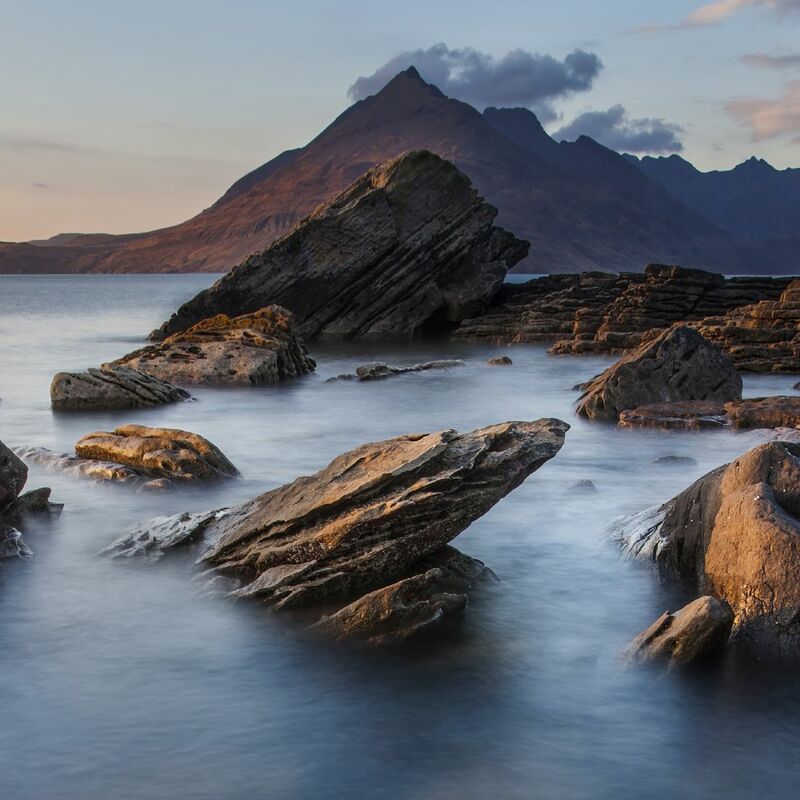 As the sunset moves southwards for the winter, it sets over the island of Rum when viewed from Elgol. 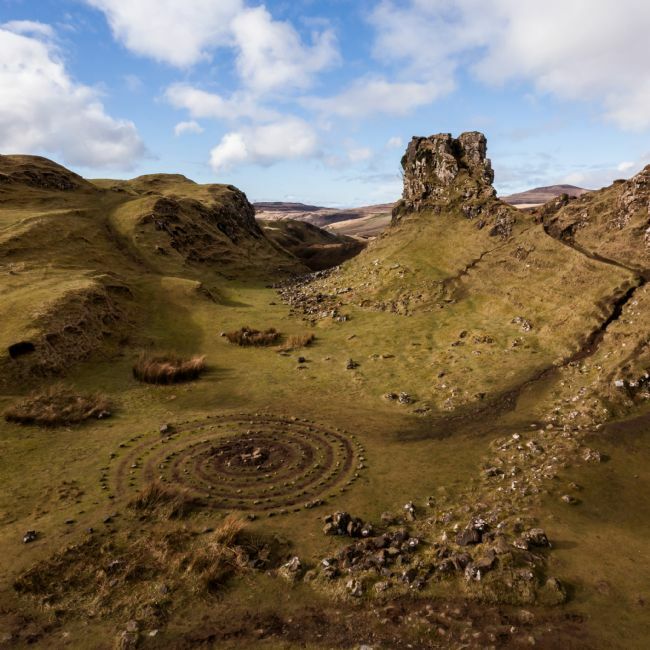 Skye's Fairy Glen has become one of the must see locations, though that has its downside. It can be difficult to get any time there without it being swamped by tourists. It's also difficult to get good lighting there, so when I visited to find good lighting and few people wandering around, I was more than a little pleased. The prominent feature, Castle Ewen, is in fact not a castle at all but a natural rock formation. If you watch the film Stardust you will see this over Michelle Pfeiffer's shoulder in one scene. The fairy ring of stones in the foreground is certainly not natural. Sadly it's just been formed to promote the mythical nature of the place. Even without that, the Fairy Glen has a very odd feel. 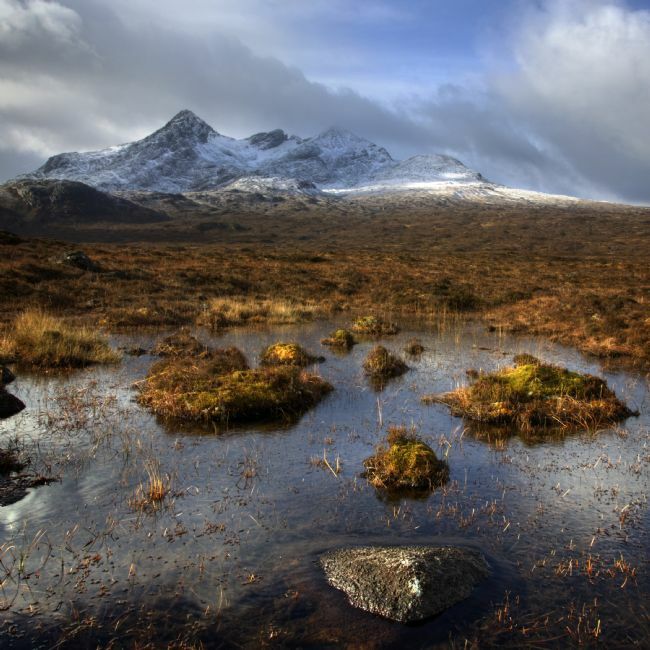 It's a landscape in miniature, and really has to be seen to be appreciated fully. 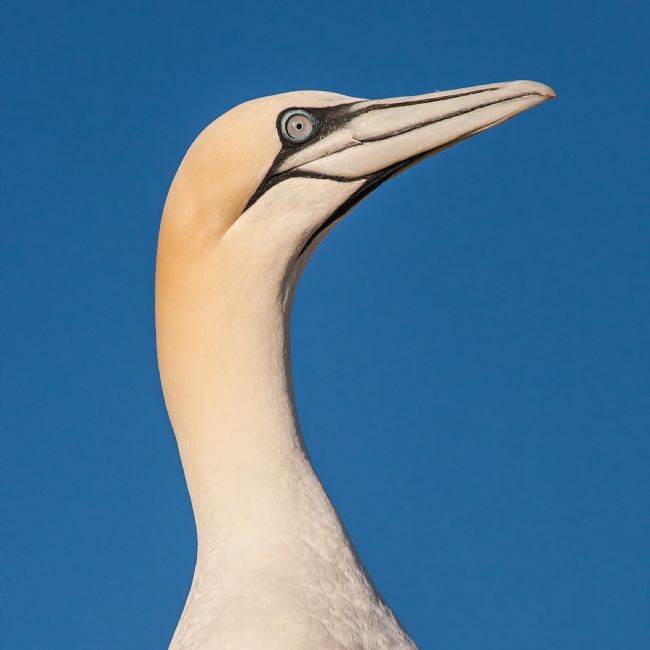 For those who enjoy simpler, minimalist images, this close-up of a solitary gannet might please. 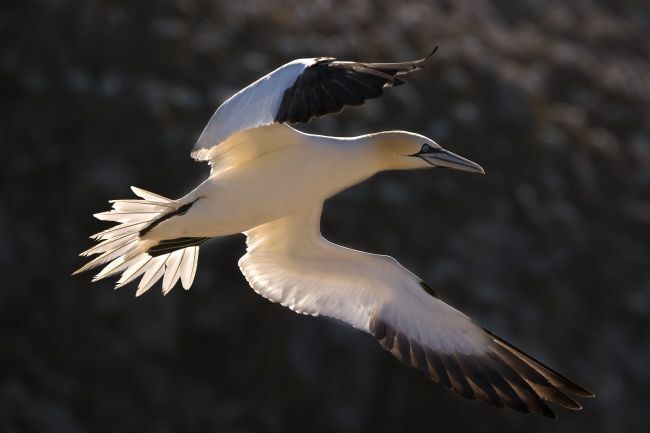 Gannets are among my favourite birds to photograph. 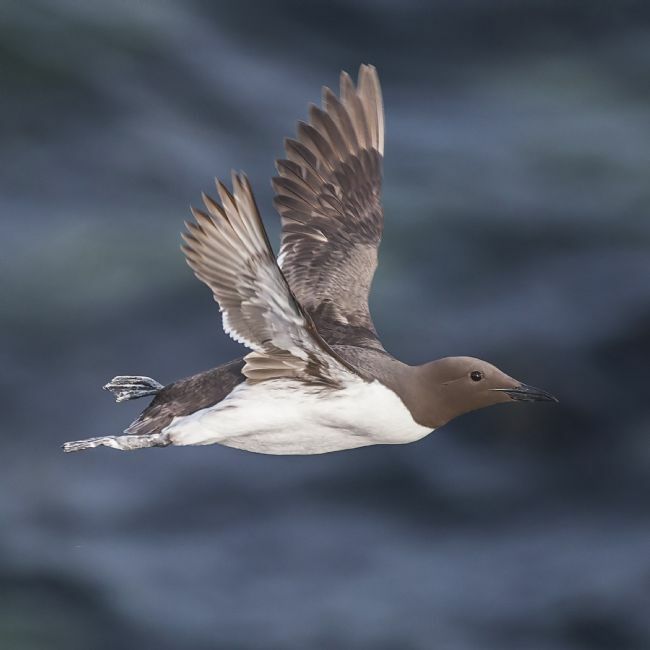 Not only are they large and relatively slow moving in flight, they form some lovely shapes and exhibit some interesting behaviour. 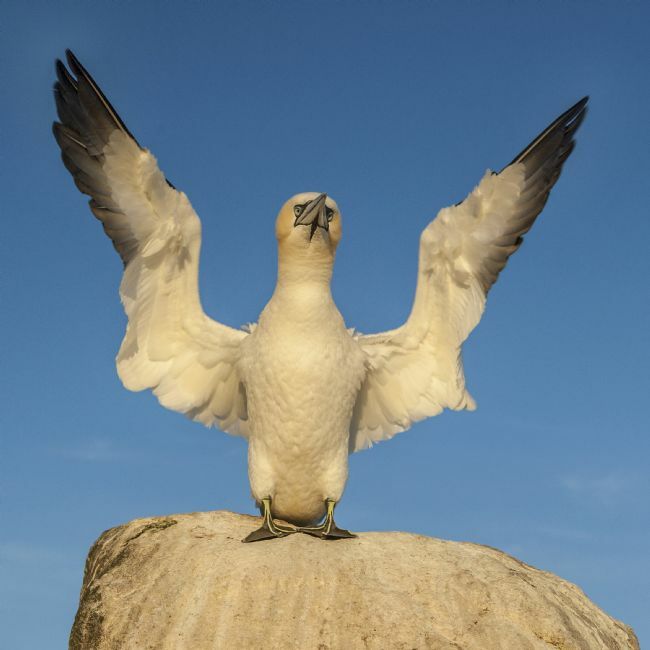 A gannet sitting atop a favourite perch, spreading its wings, looked for all the world as if it was preaching to all and sundry. 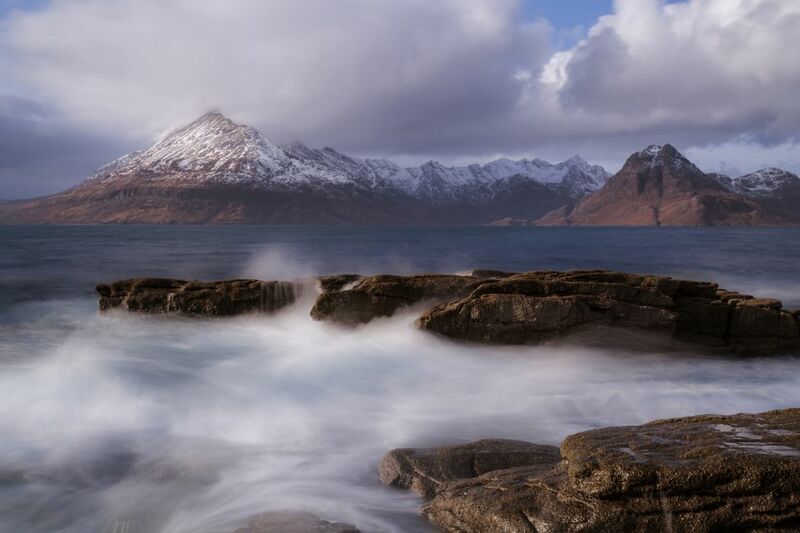 This small ledge across the river made an interesting foreground with the Black Cuillin behind. 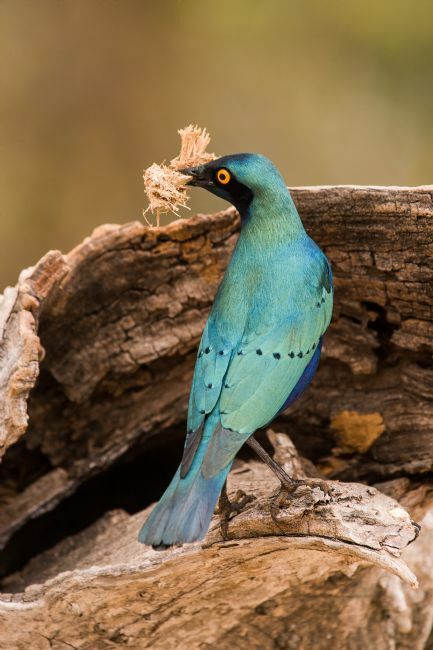 These birds are relatively commonplace in South Africa, but are nonetheless spectacular. This particular one was clearly in the process of nest building. 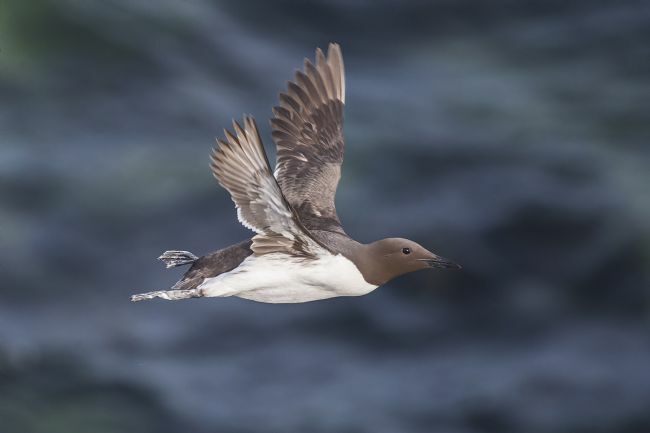 Simply a guillemot in flight! 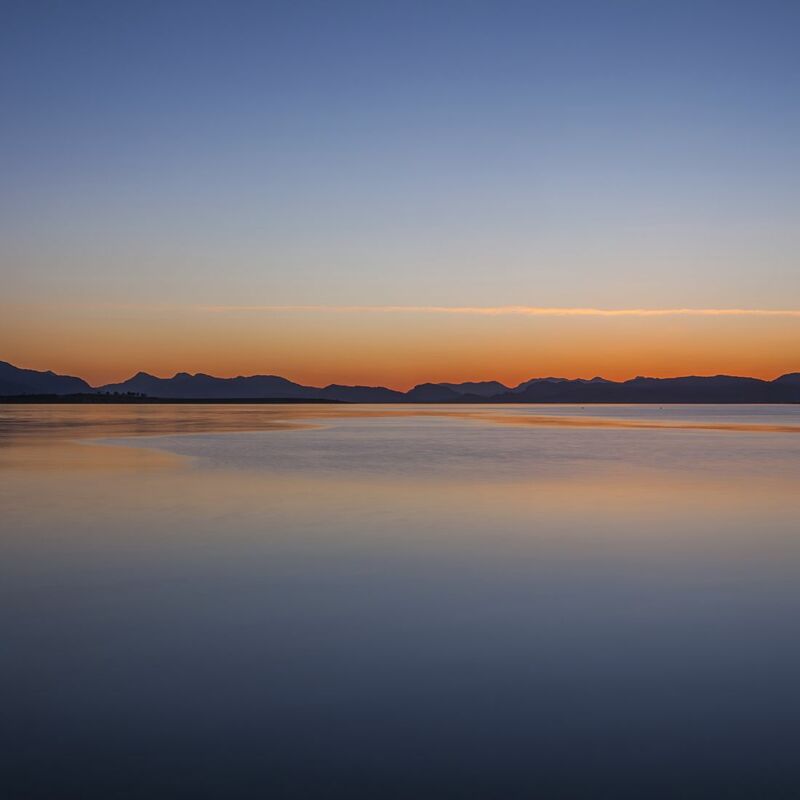 While standing at Nesit Point on Skye, the sun was sinking behind the Outer Hebrides, lighting up the sky and a slowly dissipating jet trail. 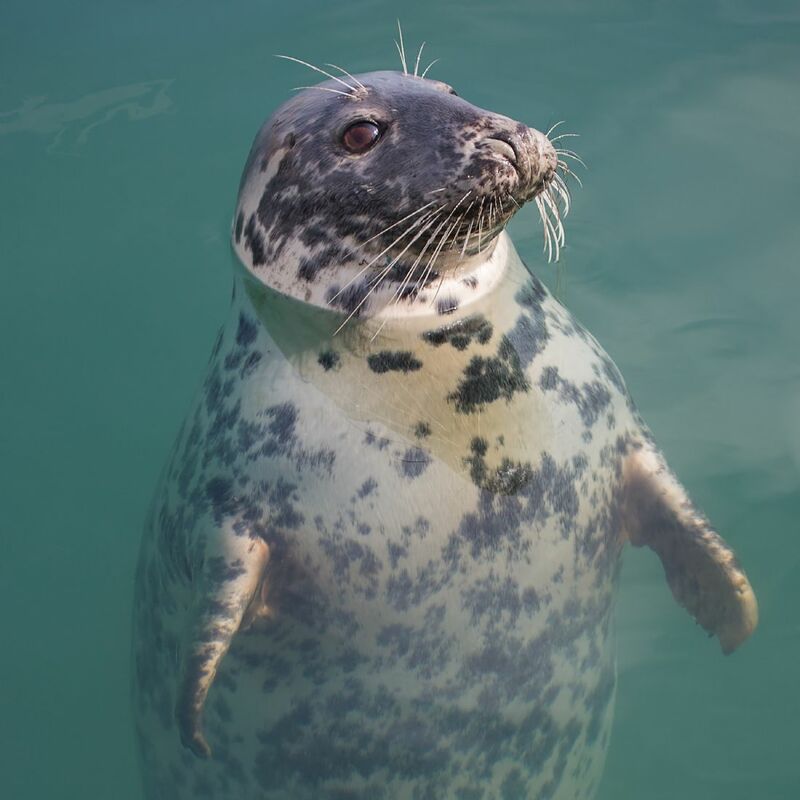 Although seen in a harbour, this is not a Harbour (or Common) Seal but a Grey Seal. This one was particularly curious, surfacing right next to a boat that about a dozen of us were boarding, and it hung around for quite a while in spite of drawing our attention. We could only wonder what it thought of our bunch of humans! 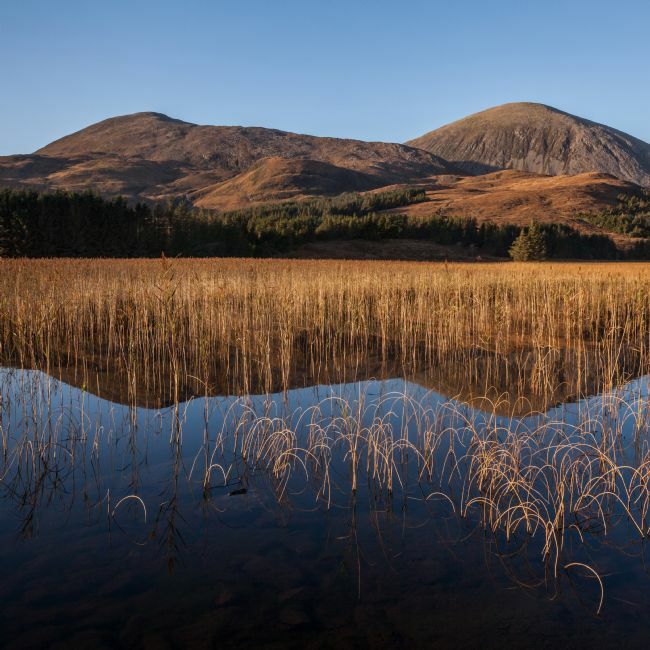 This small loch provides many wonderful photo opportunities, not the least of which involve reflections and reeds. An early morning visit here usually pays dividends. 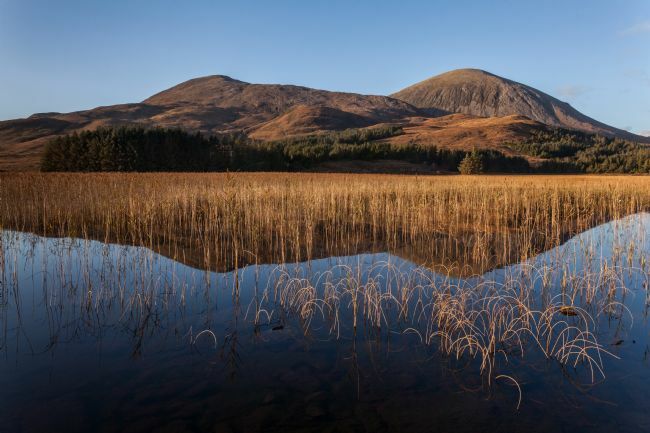 On the road between Broadford and Elgol, Loch Cill Chriosd (Kilchrist) is just one of many great photographic locations. 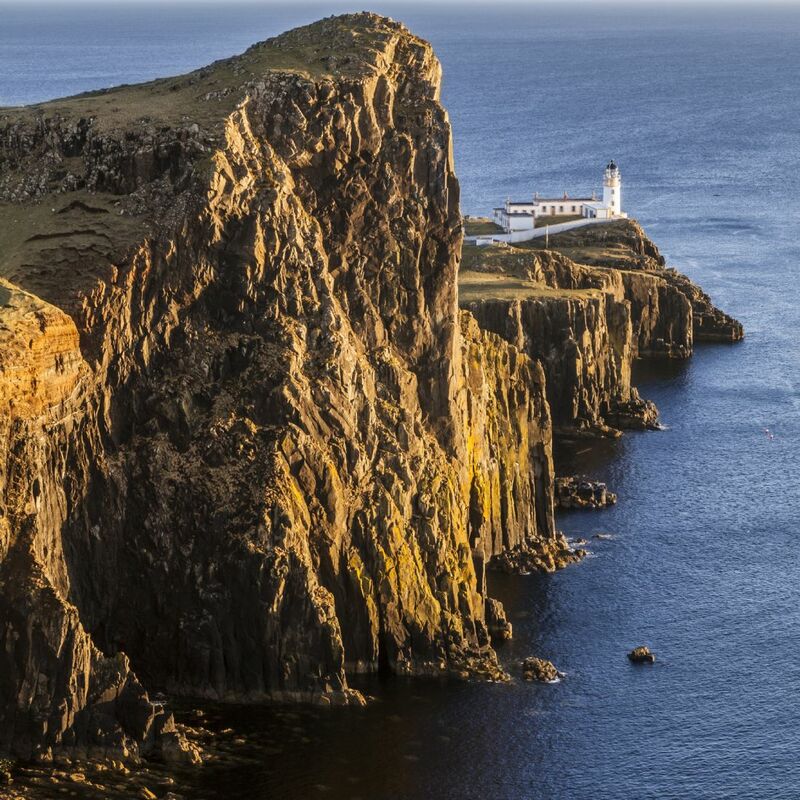 The spectacular Neist Point is at the westernmost point of Skye with views to the Outer Hebrides. 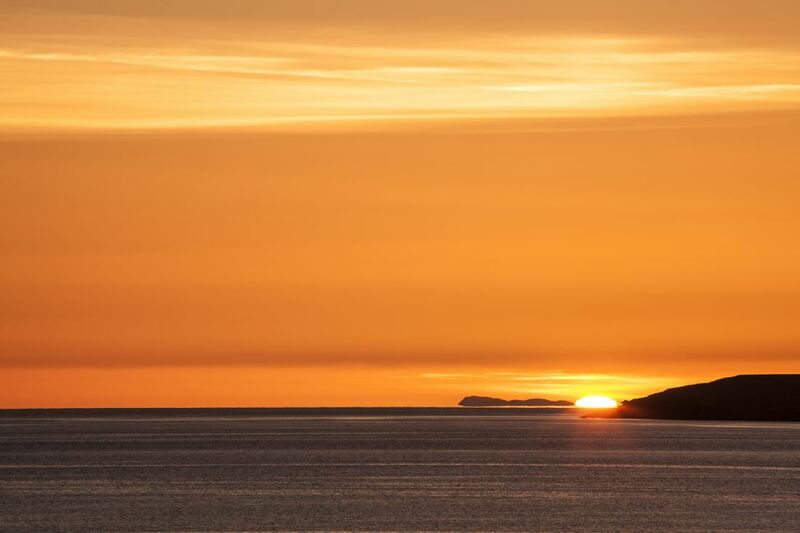 This is a late spring sunset which means the cliffs are lit by a warm side-lighting. This is, in fact, a sand pattern from my favourite location for these. This particular beach has everything that helps to form such patterns freshly, twice every day, so each visit will be unique. 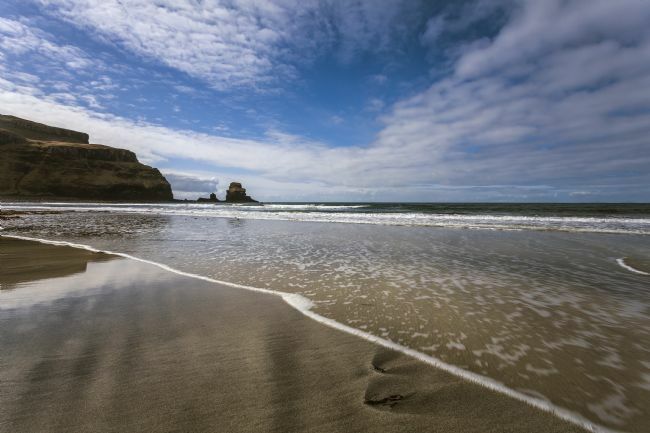 A shallow sandy beach, a stream running through it and, most importantly, two colours of sand combine to create an enormous variety of patterns. Some of the most common patterns are formed by tiny rivulets on a receding tide, leaving behind what (with very little imagination) look like trees. Here I have simply used some washes of colour in the processing to further enhance the idea of a petrified forest. These cute little birds are like missiles in flight so catching shots of them is harder than you might expect ...but very rewarding. 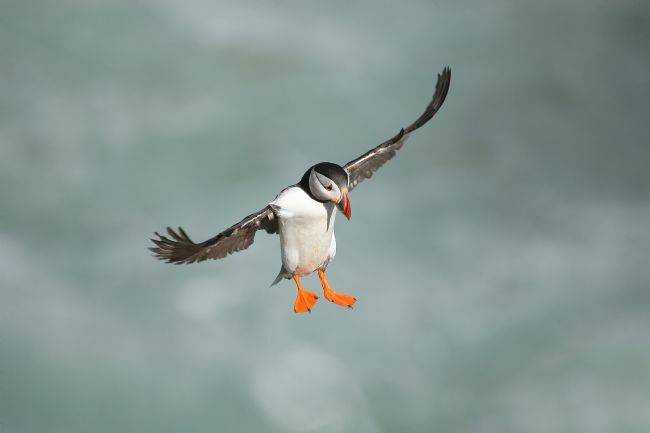 Watch out below - coming in to land! 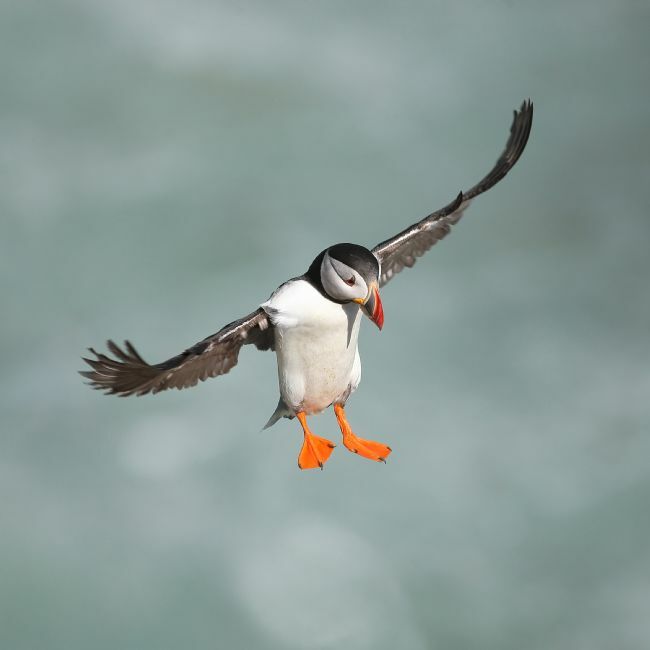 Every landing looks like an accident in waiting but, if they do get it a bit wrong, they seem to bounce quite well. This proud little bird was on its way back to its burrow with yet another beak-full of sand eels, presumably to feed a waiting and hungry brood. 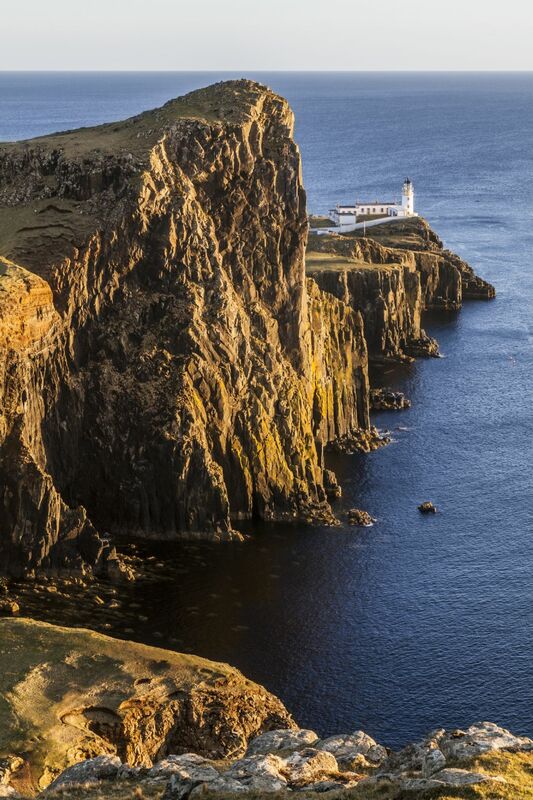 Towards the northern end of the Trotternish Peninsula, just beyond Staffin, lies the Quiraing. 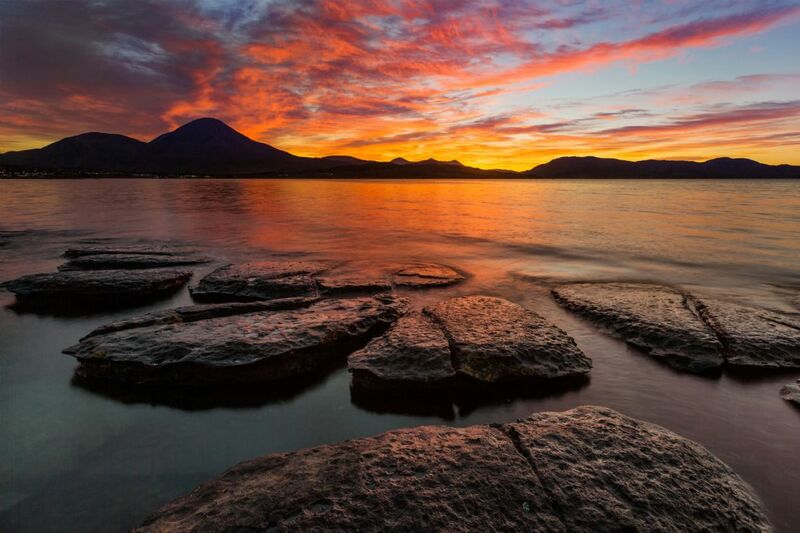 This is a spectacular area and lends itself well to morning light. It's often seen in films and TV ads, and there's little wonder why. It's a special place. As Skye awakens from winter, the snow-covered Black Cuillin mountains make a spectacular backdrop at Sligachan. 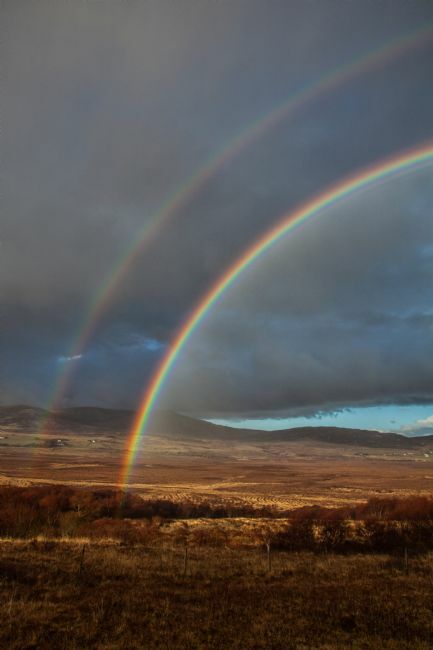 Driving between one side of the Trotternish Peninsula and the other, we suddenly were presented with the most magnificent rainbow. 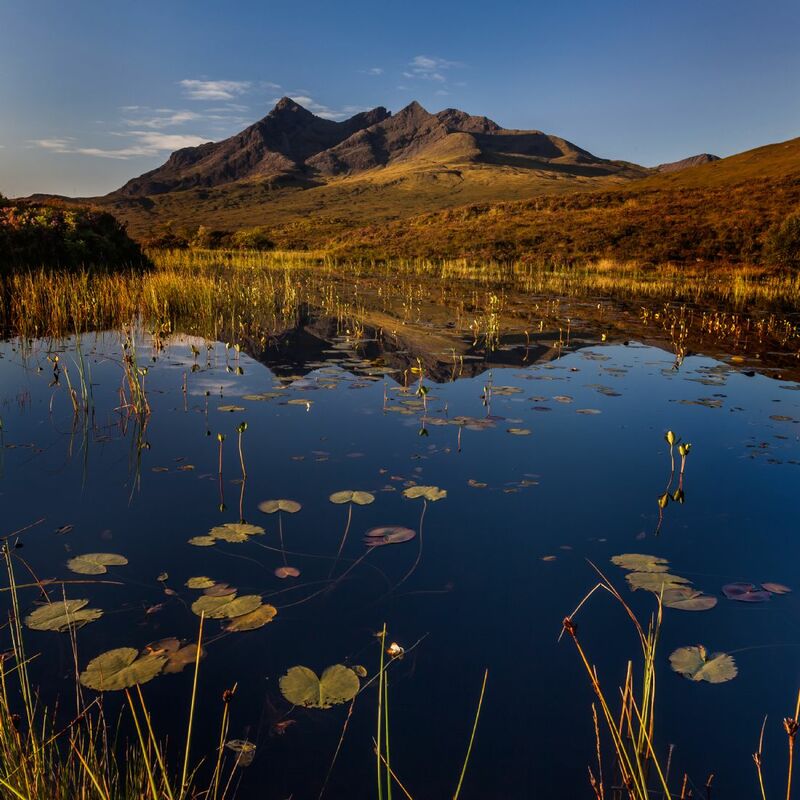 I rarely photograph Skye in the summer months but this calm morning with a ripple-free foreground and lily pads was irresistible. In under 10 minutes the sky turned from blue to purple to orange ...and then the colours were gone. It might not have lasted long but it was well worth going out on a cold, dark winter's morning to see and capture this spectacle. Talisker Bay is one of those locations that almost always leaves me with a mixture of feelings. It can be joyous, rewarding, breath-taking ...and frustrating! Time and time again I have left, feeling I'd not done it any justice, only to find that viewing the images at home told a different story. And yet, I still feel I have not captured the image there that I really want. 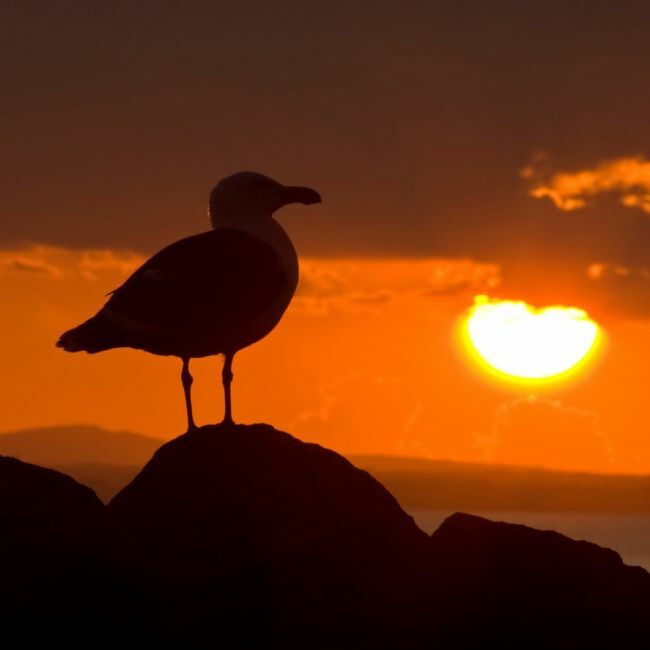 Timing is key for a successful visit to this bay. 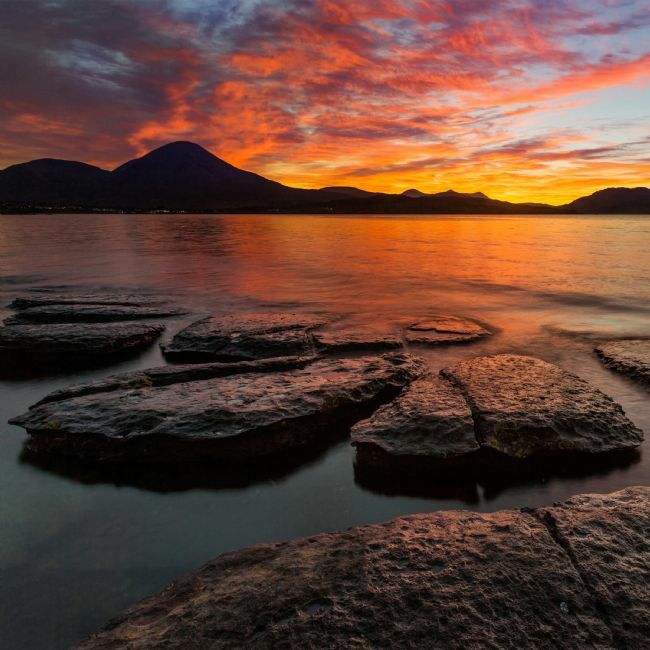 I know of many photographers who have visited at the wrong time of day and come away completely disappointed, wondering what all the fuss is about. But time it well and the iconic rock stack, a shallow sandy beach, and some magnificent skies can combine to give spectacular images. 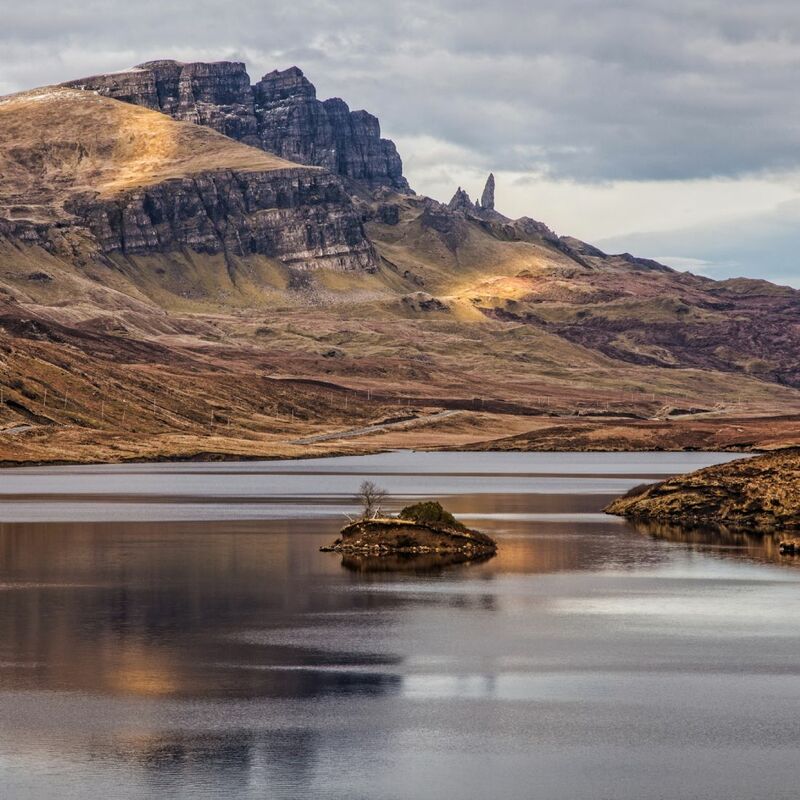 Looking across Loch Fada towards the Storr Escarpment and, of course, the Old Man of Storr, Isle of Skye. Before dawn, looking across a calm Broadford Bay, the sky along the horizon turned this beautiful deep orange. 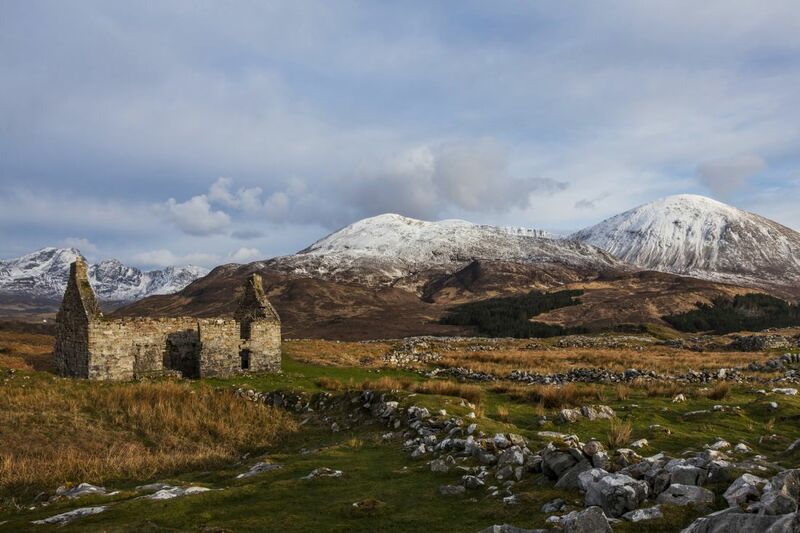 The old ruined manse at Cill Chriosd (Kilchrist) stands a short walk from the Broadford to Elgol road. The Red Cuillin with a sprinkling of snow form the background, with Bla Bheinn (Blaven) of the Black Cuillin in the distance (left). 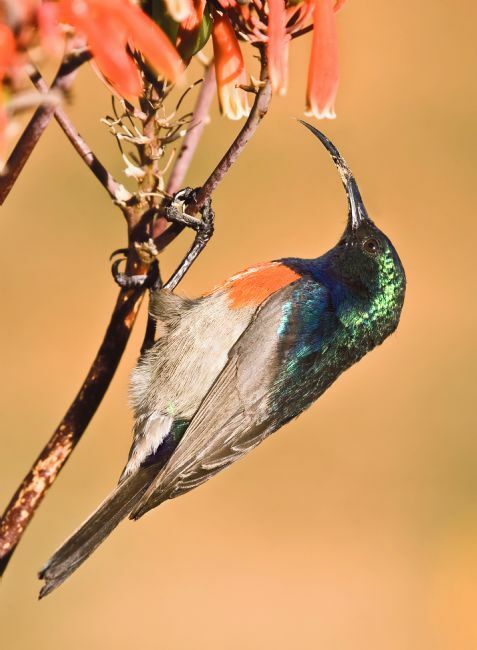 While having my lunch on a bench in the Addo Elephant Park, South Africa, this most beautiful little bird was working its way along a row of bushes nearby. 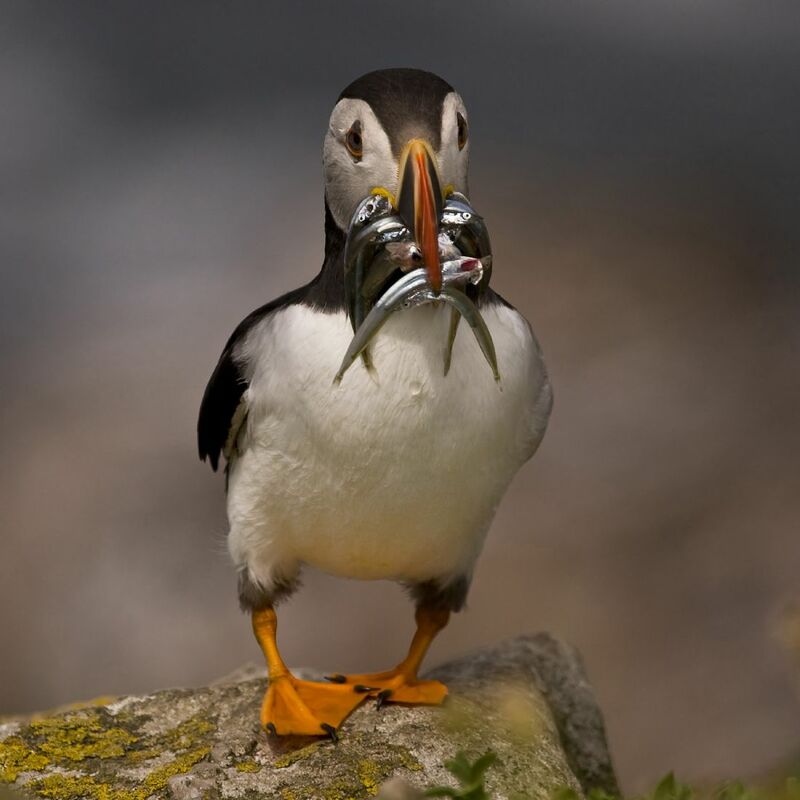 I must admit my lunch got forgotten for a while! Eilean Donan Castle is probably one of the most photographed castles in Scotland, if not the world, so finding something a little bit different was my goal. With the mountains behind shrouded in cloud, this left the castle looking very isolated, so I accentuated that by making it small in the frame. 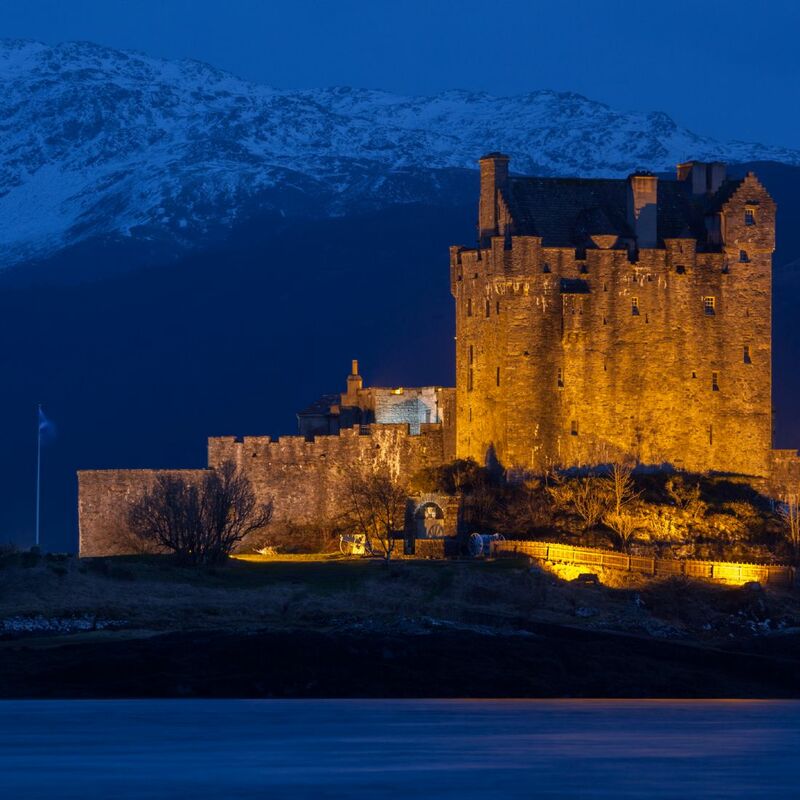 This is a more traditional night view of Eilean Donan Castle, with snow on the mountains behind giving some added atmosphere. 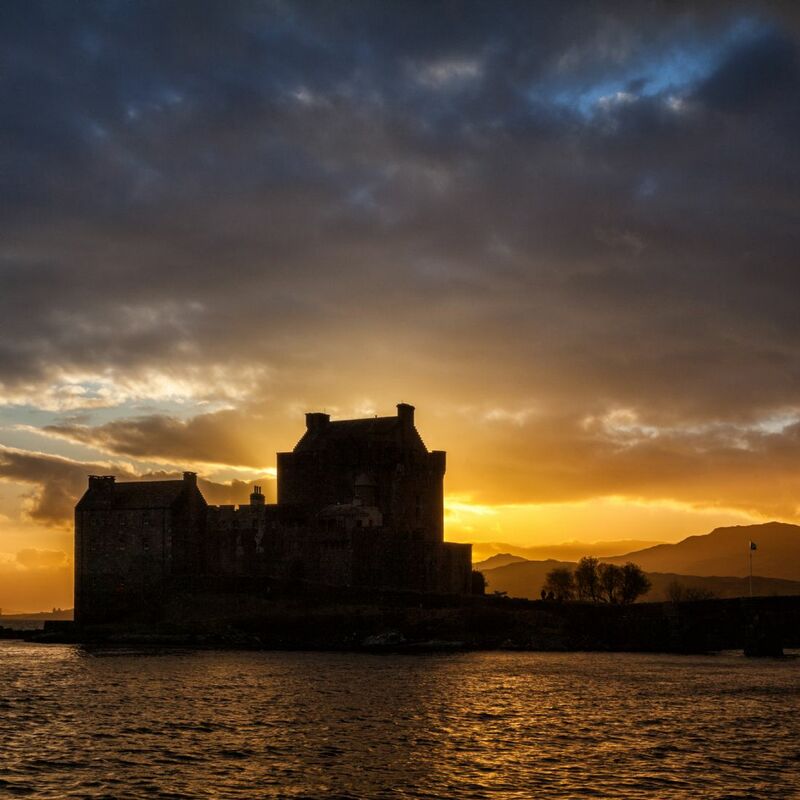 The sun dropped behind the castle as the sky turned yellow and orange. 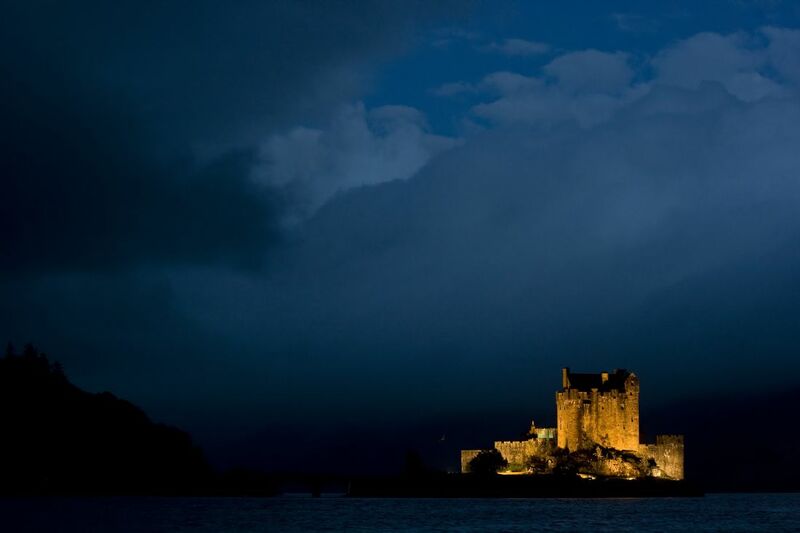 With the castle's evening lighting not yet switched on, it was almost a silhouette. 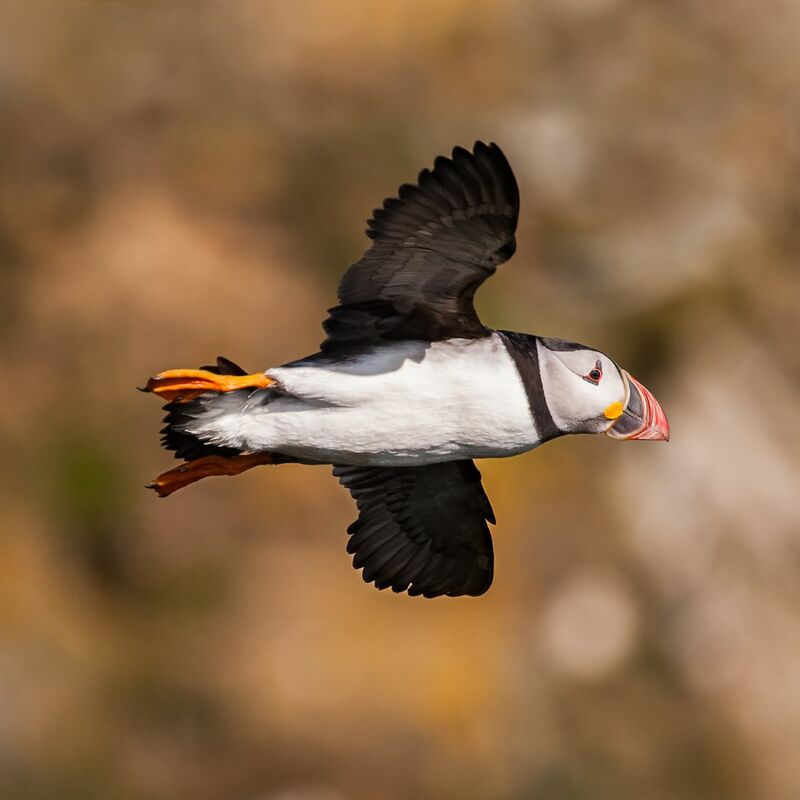 As the sun dropped, several birds appeared to enjoy sitting on a rock to watch, including this puffin. 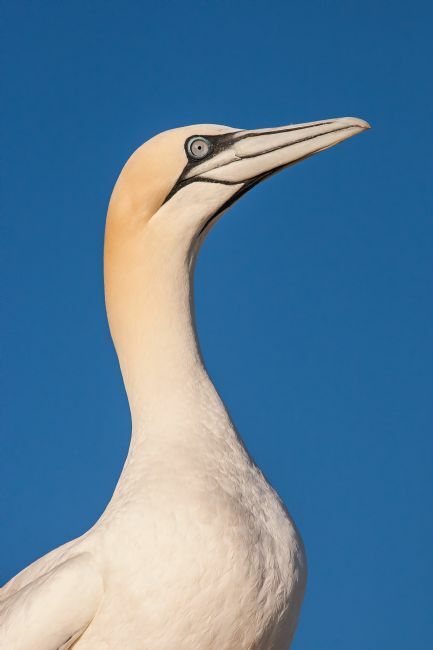 A solitary gannet on a rock at the edge of the colony. 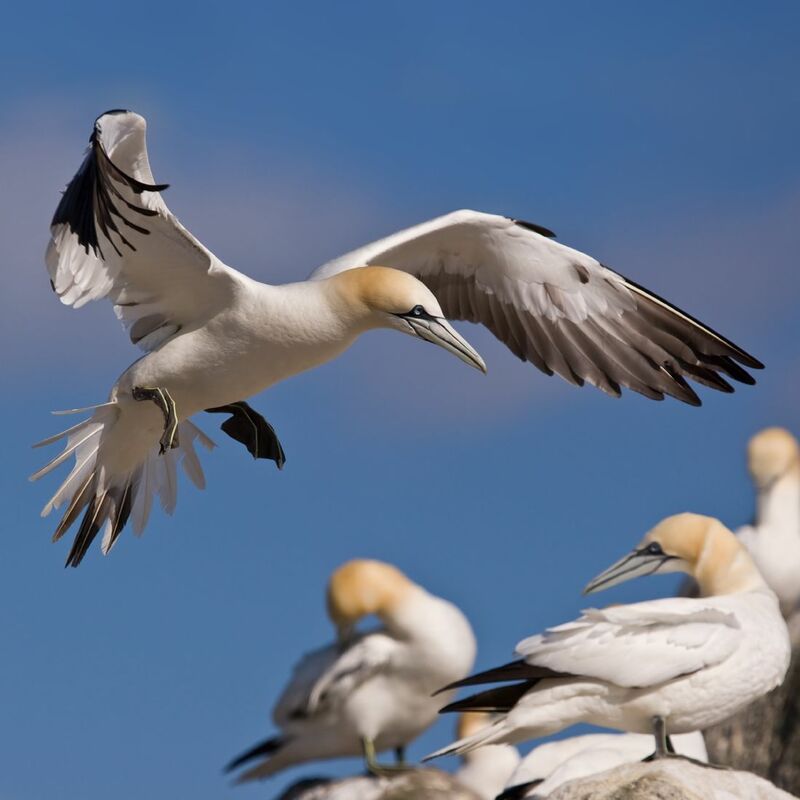 This seemed to be a favourite perch, one gannet sometimes dislodging another for pride of place. Highland Cow grazing outside of Elgol. A herd of Highland Cattle grazes around this area and can often be found walking along the verge of the road or close by. On this occasion I decided to show a single Heilan' coo just grazing in the natural surroundings. Inspired by a Wildlife Photographer of the Year winning shot of a rim-lit polar bear, I decided to try something similar. 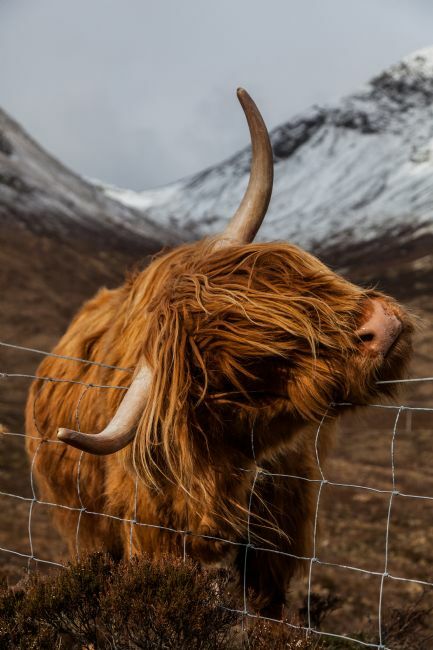 Of course, we're a bit short of polar bears on Skye but Highland Cattle abound, and I'd never seen a shot of this kind used on a Heilan' Coo so that made it all the more appealing for me to have a go at. I also enjoy minimalism, so I found the end result very pleasing. 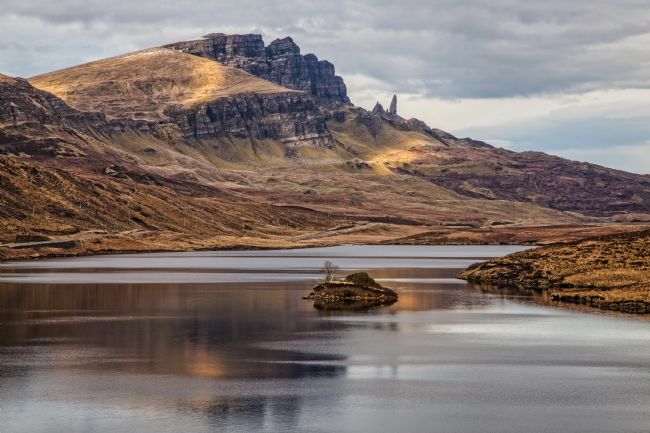 The Old Man of Storr, as with the Trotternish Peninsula and the Isle of Skye in general, sees a phenomenal range of weather conditions - sometimes all at the same time! None is as breathtaking as when some broody rain clouds are closing in. 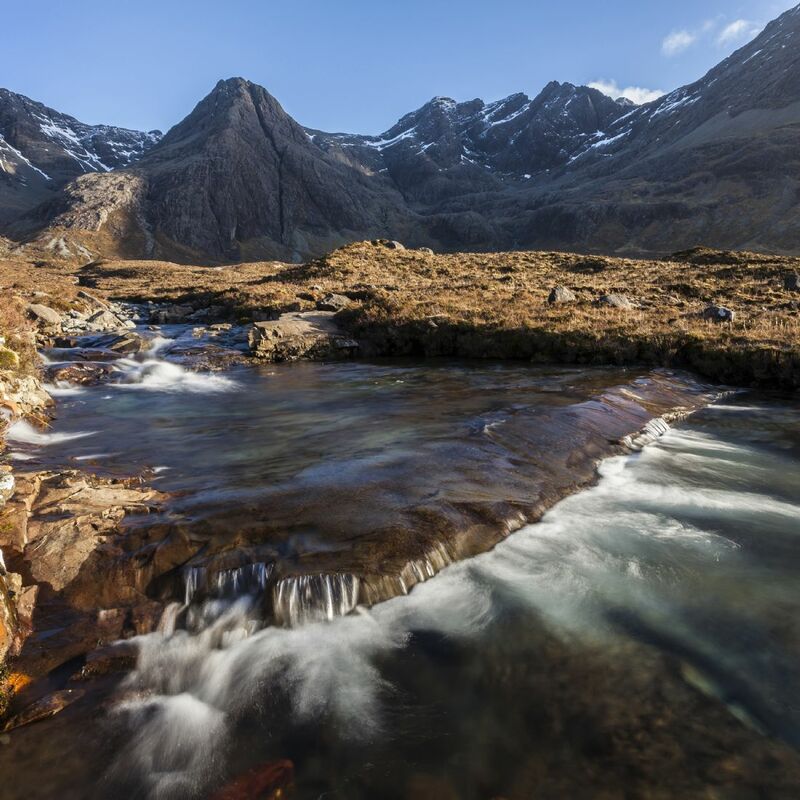 A river flows down from Bla Bheinn (Blaven), one of Skye's 12 Munros. 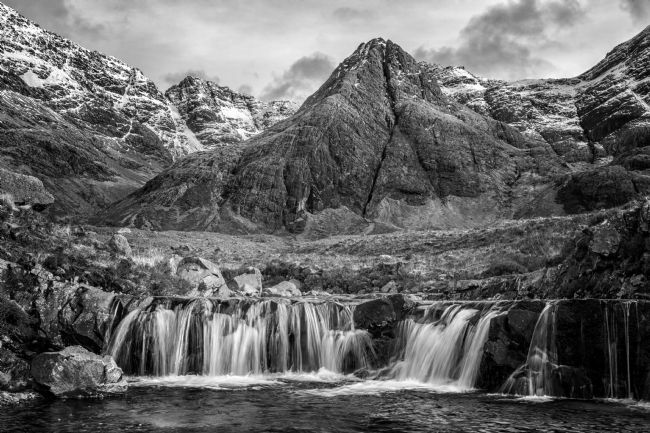 It provides some interesting waterfalls, this one being a small but picturesque example. 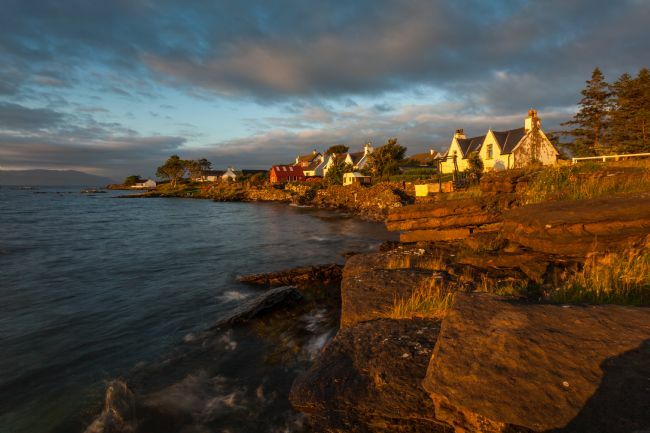 This was one of my first Skye images - shot from in front of my house! I spotted the rainbow between Skye and the mainland with the mountains just visible through the rain. While setting up the shot, the yacht appeared. Happy bunny. 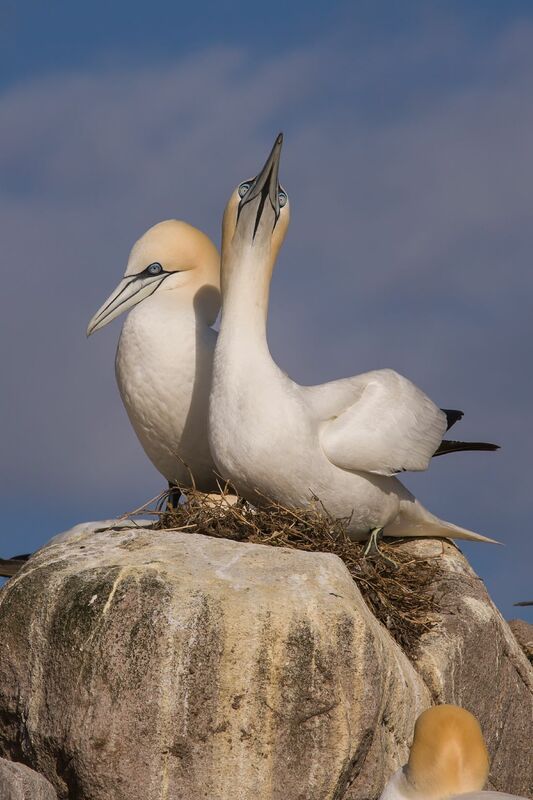 A pair of gannets nesting. 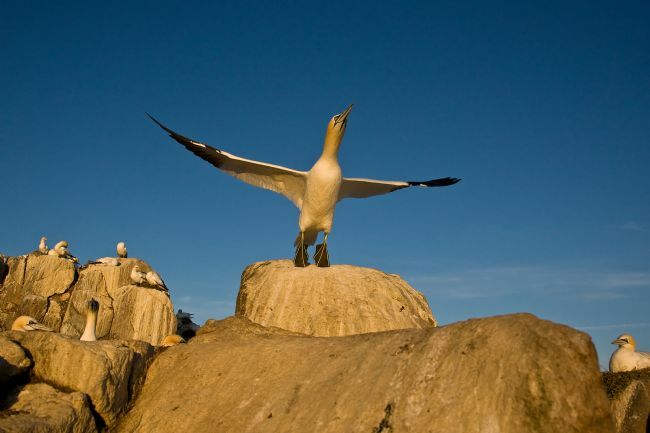 A pair of nesting gannets showing typical bahaviour. As the sun dropped to the horizon, this pair of gannets settled down for the night as part of a large gannet colony. 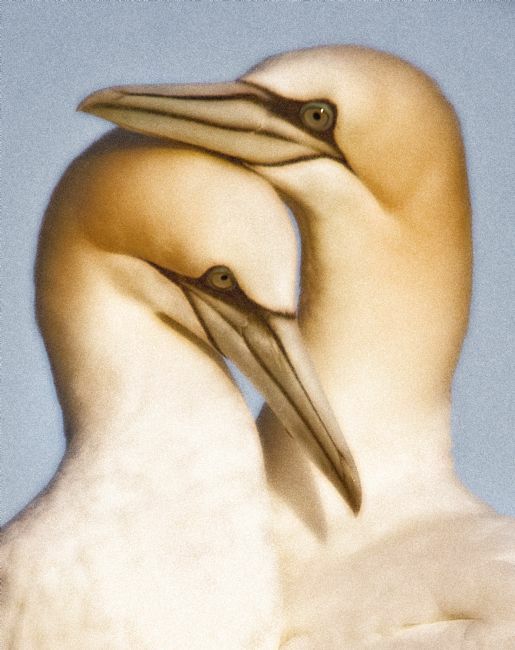 The bond between a pair of gannets is clear for all to see. I found one of my gannet photos which I felt expressed the strong bond between gannet pairs, and then went to work on it! It is intended to feel more like a crayon drawing or painting than a photo, and I hope the end result meets with approval. It did get the highest of compliments from an extraordinary wildlife and landscape photographer friend when I sent it to him as a card on his engagement so it can't be too bad! This old boat sits on the shore of Loch Harport, Isle of Skye, and gives different photo opportunities depending on the tide. My favourite is with the tide in, partially submerging the boat, as seen here. On this occasion I arrived to shoot, not realising quite how high the tide would be, and the boat was nowhere in sight! So, time to listen to some old CDs in the car while watching the water slowly drop. 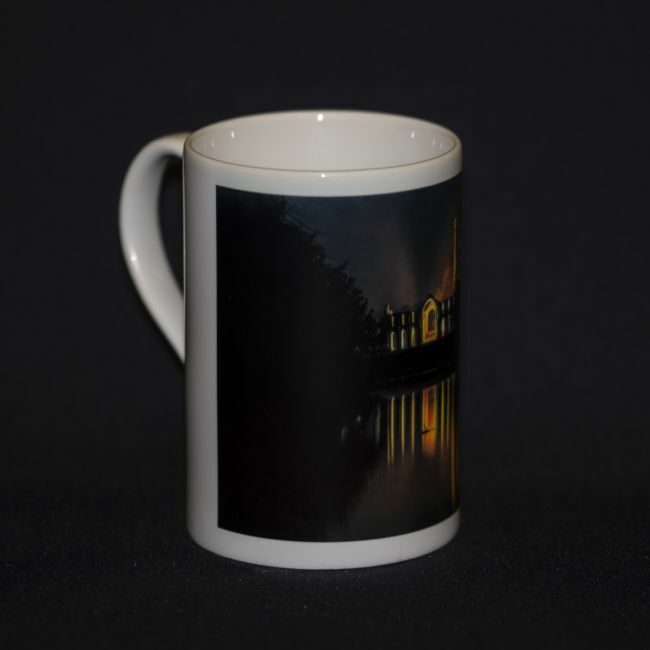 By then it was quite dark but this only enhanced the shot, allowing me to take a very long exposure. 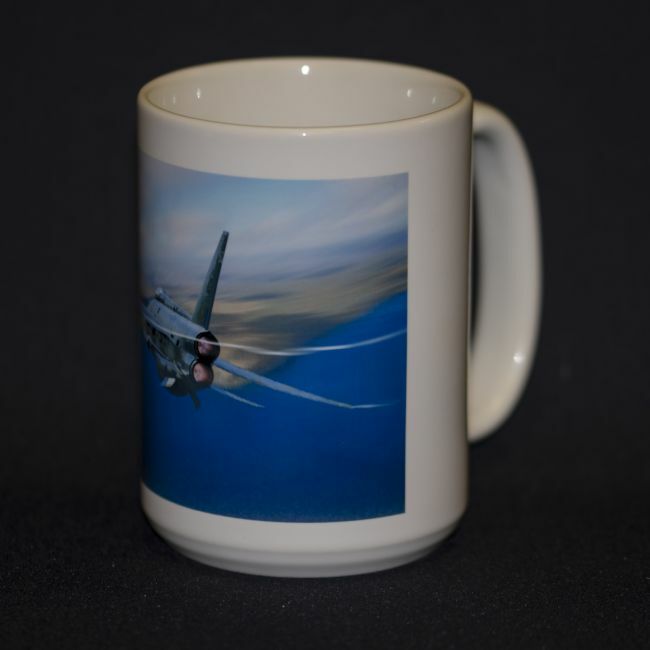 Further manipulation of the image to produce this final result included my own tweak of the Orton effect. A Heilan' Coo with an itch - too good to miss! While standing at Neist Point on Skye, the sun was sinking behind the Outer Hebrides, lighting up the sky and a slowly dissipating jet trail. 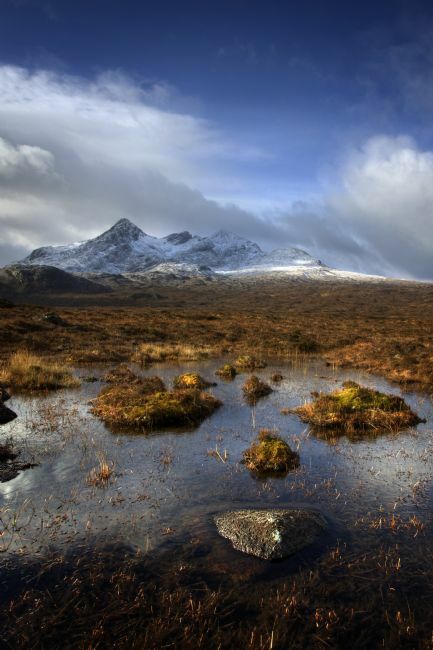 Morning light on the Old Man in February with the distant Black Cuillin at Sligachan behind. 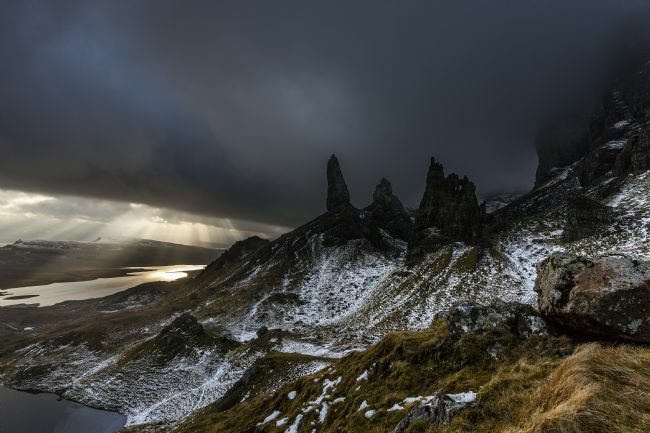 First light at the Old Man of Storr in winter or spring is an indescribable delight, and you don't even need to be up as early as you would later in the year! 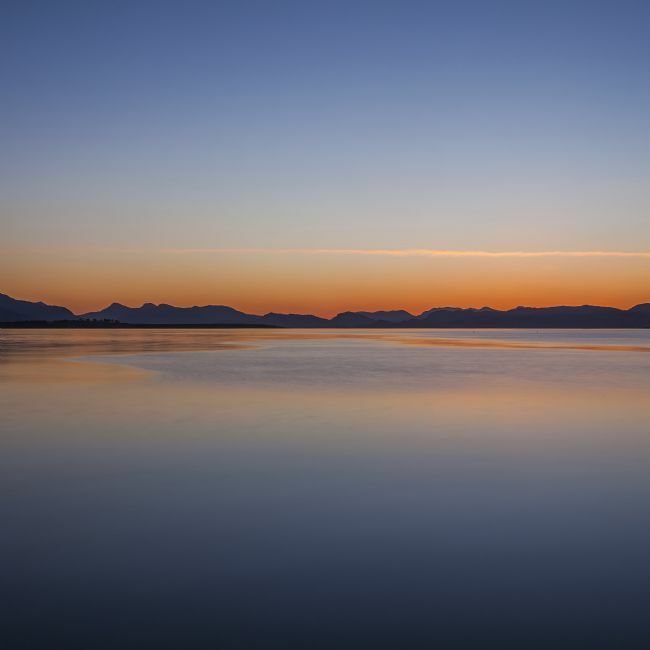 The sun rises over the distant mainland mountains and casts a wonderful light. The pink hues seen here in the snow are perfectly genuine. The remains of this old boat, covered in yellow seaweed, is visible at low tide, and makes for an eerie and intriguing shot. 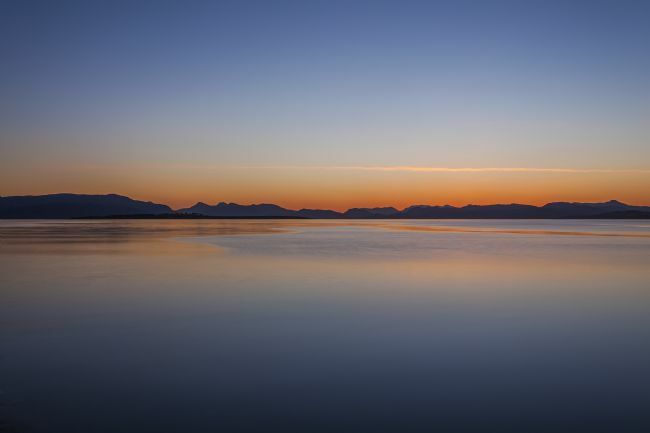 Before dawn, looking across a calm Broadford Bay on the Isle of Skye, the sky along the horizon turned this beautiful deep orange. A gannet sitting atop a favourite perch, spreading its wings, looked for all the world as if it was preaching to all and sundry. Meanwhile one head below appears to be watching intently. 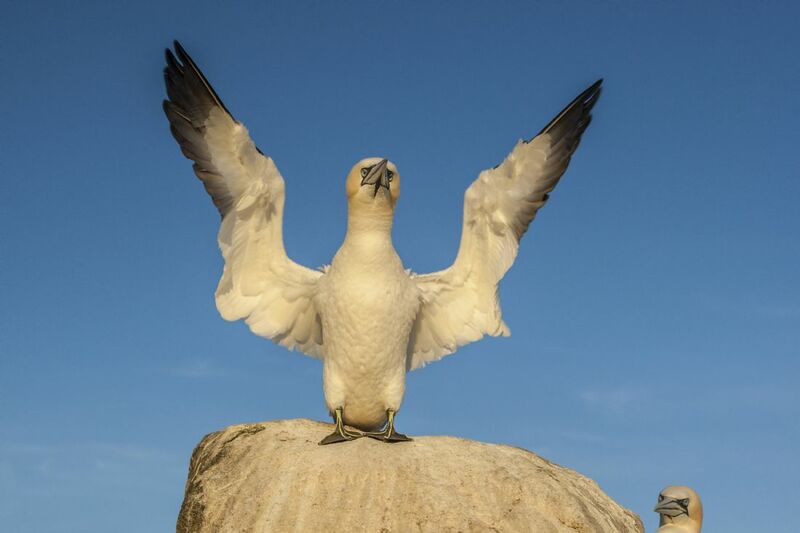 Wings outstretched and on the point of taking off from a favourite perch, this gannet was about to soar. The top pools of the Glenbrittle Fairy Pools, Isle of Skye, may be colourful, but I still felt this would make a good monochrome, so here it is.